A couple weeks ago, a virus had its way with my family. Within a four-day span, all four of us were incredibly sick for 24 hours at a time and it seemed there was nothing we could do to stop the next person from getting it. That’s because despite how careful we were – quarantining the sick one to a bedroom, dispensing large bottles of hand sanitizer, etc. – it’s impossible to be fully conscious of every single time your hand touches something else in the house. For example, we each hold the handrail when coming down the stairs by habit without even giving it a thought. It’s not much different for companies that have employees who are active in the social media space. And, honestly, what company doesn’t have at least one employee with a Facebook page or Twitter account? Social media is like a rabbit hole and it’s easy for employees to either not be fully conscious of all the places they touch or forget that Google can find just about anything. A rude comment on a blog post here. A disparaging Tweet about a client’s home city there. Posting unapproved client work to her online portfolio because she really liked the concept, even though the client picked a different direction. They can seem harmless enough at the time, but each of these can have a negative impact on your business and strain client relationships. That’s why all companies should have guidelines for employees that outlines what’s acceptable in social media participation and what’s not. This isn’t to keep them out of social media networks because these tools can bring a lot of good to your organization. But the guidelines remind employees that their online actions can have consequences for both the company and them, and it gives them guardrails to help keep them from mistakenly going off track. Does your company have these guidelines in place? If so, do you feel they’ve been helpful in better protecting the brand? Should companies have any “say” in what employees do online with personal accounts? If you enjoyed this post, please consider subscribing to my RSS feed, either by reader or by e-mail. While you’re at it, consider connecting with me on Twitter, too. A few days ago, my friend Susan Iskiwitch asked for my thoughts on PR agencies ghost blogging for clients. The timing was interesting since I had just been asked a similar question by Scott Meis as part of a Q & A post for his blog. PR folks have been ghost writing for clients forever – bylined articles, quotes in news releases, speeches, key messages, opening remarks, etc. To be honest, I’ve never thought twice about it. It’s part of the job. It’s what we do. We determine the best way to communicate strategically and then set out to painstakingly write prose that delivers. It may seem like splitting hairs, but in my mind there’s a difference between ghost writing the typical items mentioned above and ghost writing blog posts, Twitter “tweets,” and blog comments. That’s because there is a different expectation in place when it comes to social media engagement. When reading a newspaper article with quotes or watching an interview on your local TV news affiliate, there’s no expectation of interacting with the person being interviewed. It’s passive. Not so in social media. People engage with the tools because they want to connect with people. If you don’t tell people that in fact an outside party is blogging on your behalf, then your social media efforts are a sham. And when you’re found out, you will lose trust. So let’s say you are up front with the fact that your agency is blogging on your behalf. That’s not ghost blogging, but I’m still not a huge fan of it. Chances are good that no one will get upset about it since you’ve been transparent, but you miss out on one of the biggest benefits of social media, which is its ability to humanize your brand. In my opinion, the best way to bring your organization’s humanity to life is with voices from within the company. 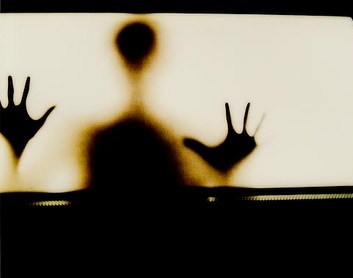 Agencies can bring a lot of value to the content their clients’ create online in numerous ways, but I don’t think ghost blogging is one of them. Am I looking at it the wrong way? What do you think about ghost blogging? If you enjoyed this post, please consider subscribing to my RSS feed, either by reader or by e-mail. Many marketers are still apprehensive about involving their brands in social media initiatives. Quite a few still deny that their brands have anything to gain from interacting in the space. I agree that you have to dive in because it’s right for your brand and NOT because you suffer from shiny object syndrome. After all, social media isn’t right for all companies. But I venture to say that it makes a lot of sense for most. Why? Here are three reasons why it matters and why your brand should seize the opportunities it affords. One opinion matters more than ever. People have always shared their negative and positive brand experiences with friends and family, but we have a small circle of influence in the offline world. And it takes a decent amount of effort to rant or rave by phone, e-mail or in-person with everyone you know. So you tell a few of them. Thanks to social media, the circle of influence that consumers now have has never been bigger. It allows them to cast wider nets by connecting with more contacts. Frequent interaction within the networks and adding value within them also builds each consumer’s level of influence among their contact. It’s also MUCH easier to rant or rave with social media tools. In 45 seconds, a consumer can use her wireless phone while sitting at a restaurant to praise great service on Twitter, Plurk, her Facebook status, and FriendFeed. In short, consumers can share experiences with significantly more people than before and they can do it faster and easier than ever. 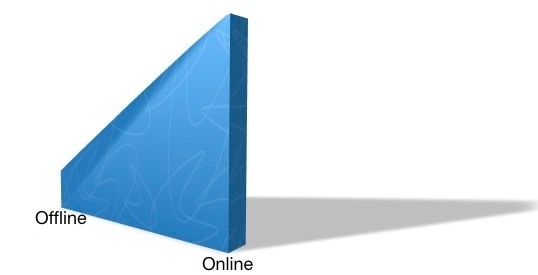 This image by Sam Lawrence illustrates the difference in size between our offline and online networks. Consumers are connected across many social media platforms. We talk about touch points because we know that the more a consumer sees a brand’s message, the more likely they are to recall it. The graph below from Steve Jurvetson illustrates how members of my social media networks are connected to me in more places. If I have a positive experience and mention it in my Facebook status, send a “tweet” about it on Twitter, share a “plurk” on it and write a blog post about it, a good percentage of my connections will see that message in more than one place. That means that my messages about a brand have a good chance of becoming part of how others see that brand. Brand reviews within social media play a big role in consumers’ purchase decisions. The numbers don’t lie. Here are some interesting stats that show how consumers use social media to determine which brands they buy. There are, of course, more than three reasons why brands should care. What have I left out? What compelling information have you used to help show its importance to your clients or within your organization? *UPDATE: Please click here to read this post on my new blog and ensure your comments are included in the right place. I no longer check/update this WordPress.com blog. We’re all looking for ways to become better professionals. From conferences and webinars to books and seminars, we spend good money and give precious time to glean insights from accomplished marketers. Those are great, of course, but what if I told you that you can get smarter for free with Twitter and 20 minutes or so a day. Twitter is a free micro-blogging service that allows you to share what you’re doing in 140 characters or less. You can follow friends, coworkers and people you’ve never met before who may share similar interests. And, they can follow you and your updates. Here are five ways Twitter will make you better at whatever it is you do. 1. You get access to different points of views. First, the value of your Twitter experience will depend largely on the people you follow. If you only follow people whose updates are always about where they’re eating lunch or the weird guy in line in front of them at McDonald’s, then you’re not going to get much out of it. On the other hand, you can find and follow folks who sometimes “tweet” personal updates, but also share great thoughts on their industry or ask probing questions. I follow a lot of people in the marketing and social media business. 2. The people you follow point you to great resources you wouldn’t find otherwise. You can only scan/read so many blogs. So what about all the great content out there you’re not finding, reading and retaining to get smarter? Most of the people I follow “tweet” about great blog posts, white papers and books they find, along with a url to the site. I choose about five a day to click and read. So, every day, I’m pointed to great content I wouldn’t have found otherwise that’s been pre-screened by other smart marketing folks. 3. You can poll your followers. 4. You can learn what consumers are saying about your company or your client’s brand. Want to get an idea of what others say about your company or your client’s brand when they’re among friends? Well, you can find out if either is being talked about on Twitter. Check out Twitter Search. 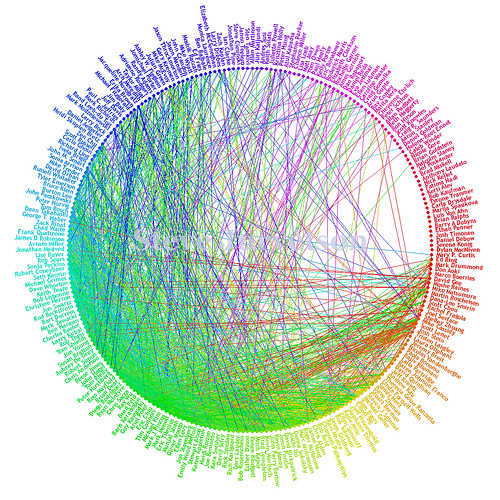 It’s like Google Search, but it only searches for your key words on Twitter’s network. If someone trashed your client’s new promotion on Twitter last week, you’ll see it. If someone raved about the new product yesterday in a “tweet,” you’ll see it. It provides some great insights into how others view your brand. By the way, you don’t need a Twitter account to run a Twitter Search and see results. Whether you’re on Twitter or not, you should use it periodically to see what’s being said about your company or your client. 5. Twitter will make you a better writer. T.S. Eliot once said “If I had more time, I would have written a shorter letter.” Writing succinctly is hard. Writing succinctly and clearly is even harder. Sharing your point of view and great blog posts you come across in 140 characters or less is a wonderful exercise in both. As with all things, it’s better to give than to receive. Once you join Twitter, you’ll make others smarter by sharing your thoughts and great reads while building new professional relationships. If you use Twitter, what have I left out? How has it made you smarter? If you don’t, give it a test drive. Follow me and I’ll follow you back. And we’ll get smarter together. A couple weeks ago, I asked a question. Should we keep personal and professional separate when it comes to social networking? Specifically, I had been struggling with what to do about facebook. I’ve always used it as a place for friends and never used it to connect with professional contacts. I limited that to LinkedIn and twitter. After getting a lot of comments (for a newish blog, at least) on the post and a ton of responses to the similar question I asked on LinkedIn, it’s obvious that others are talking about this, too. They ranged from “No way should you put them together” to the opposite end of the spectrum. Some people were middle of the road. I’m going to open up my facebook to communicate with both personal and professional folks alike. What did it for me? I was reminded firsthand of the benefits of keeping connected with professionals beyond just LinkedIn and twitter last week. A former coworker, Mark, who I’m really good friends with was visiting Chicago. Another former coworker, Rakesh, moved to Chicago about two years ago with his wife. We hadn’t really stayed in touch. My friend asked if I had Rakesh’s mobile number. I didn’t. But I remembered that we are still connected on facebook. I sent Rakesh a message to let him know that Mark was in the Windy City and wanted to get together. I also gave him Mark’s mobile number. Rakesh got the message and gave Mark a call so they could hang out. So what’s the big deal? It’s a great picture of the power of connections – about being able to bring the right people together, regardless of the reason. Whether it’s helping two guys connect for a beer in Wrigleyville or helping someone find a PR pro well versed in social media who happens to live in Ohio, it would be beneficial to me and the community at large to be able to come through and help from time to time. Don’t worry, though. I’ve updated all my privacy settings so family and friends can see my kids without barraging professional contacts with too many photos from our weekend at the beach. As beautiful as my kids are, it’s scientifically proven that you can only take so much of seeing other people’s kids before it gets nauseating. So, want to connect on facebook? If so, you can find my profile here. And feel free to connect with me at other places here. When it comes to social networking utilities, should there be a line in the sand on whether it’s for personal contacts or professional connections? That’s what I’ve been struggling with of late. Maybe I should share with you what first made this question come to mind for me. When I joined facebook a while back, I “friended” a lot of coworkers, some of whom I am friends with outside of work and some of whom I am acquaintances with at work. About a month ago, one of my coworkers that I’m acquaintances with had a major event happen in her personal life, which I found out about through facebook. She’s nice. We say “hi” to each other. But this is something I don’t believe she would have told me in passing. We’re not close enough. Now, you could say that she shared it on facebook, so she must not have minded telling everyone. But I still felt weird finding out about it that way. I also had a couple clients friend me recently on facebook and it made me a little uneasy. Not that I put things on there that are crazy and kooky. Just the normal stuff like photos of my beautiful family, friends writing funny things on my wall, etc. But what if one of those funny groups I joined to laugh about with friends isn’t seen as funny by a client. Things that people know about in our personal lives that they wouldn’t have known about pre-social networking can color their opinions of us in our professional lives. That’s my concern. So I decided to save facebook for my personal contacts and Linkedin and twitter for my professional connections. But I’ve noticed lately that a lot of fellow bloggers whom I respect have links to their facebook pages on their blogs. Folks like Chris Brogan, Mack Collier and Lara Kretler. Should I rethink my assessment? Am I going about it the wrong way? Am I missing out on great exchange by not opening up facebook to professional contacts as well? What do you think?